AWS is launching the Amazon Elastic Container Service for Kubernetes (Amazon EKS) and is announcing JFrog as a proud integration partner. Over the past year, it seems that even companies that weren’t in the first phase of Kubernetes adoption are now joining the party. JFrog has been a key part of the container movement, launching an enterprise-grade Docker registry back in 2015. Now, nearly three years later, we offer a robust Kubernetes Registry that is compatible with a growing list of Kubernetes cluster providers. A k8s cluster (which EKS has incredibly simplified). A pipeline (which you can get from many sources including our partners, and soon to be available on AWS CodeStar). 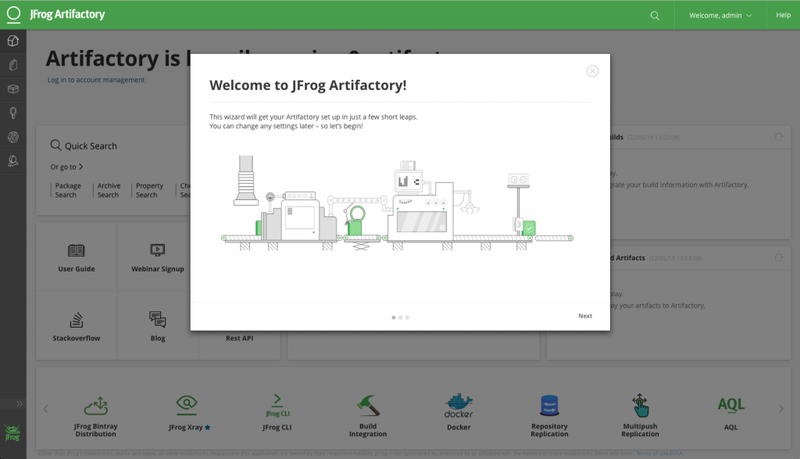 JFrog Artifactory serving as your Kubernetes registry. In this blog post, we’ll show you how to quickly and easily configure Artifactory as your Kubernetes registry for EKS. Artifactory can run from a number of possible locations. Our example is based on subscribing to JFrog Artifactory Cloud through the AWS Marketplace. Subscribing to Artifactory on AWS through JFrog. Deploying Artifactory to the EKS cluster (HA or single node) using a Helm chart. Using an existing Artifactory instance. Subscribe to JFrog Artifactory Cloud through the AWS Marketplace. Following your subscription to AWS Marketplace, JFrog generates and sends you an email with your account details and user credentials. Use your assigned credentials to log in to the JFrog Artifactory Account Management Dashboard to view and control your account information. Click GO TO MY SERVER to launch the Artifactory onboarding wizard. Select the software repositories you want to manage. 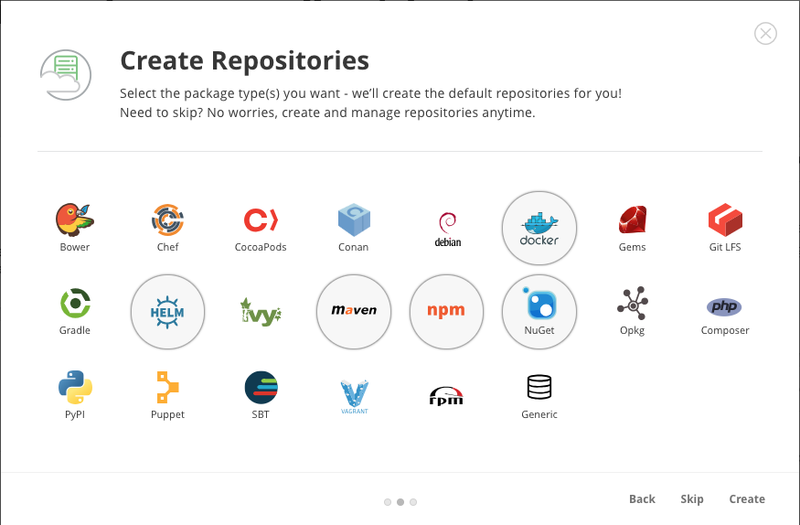 In this example, we have only selected a handful of repositories including Docker, Helm, Maven, NPM, and NuGet. A configuration summary is displayed when you complete the wizard displaying all the handy things that were configured to make your life easier including local, remote, and virtual repositories. To learn more about how to plan for production, see Best Practices for Structuring and Naming Artifactory Repositories. Now let’s configure Docker to use Artifactory as your private Docker registry. 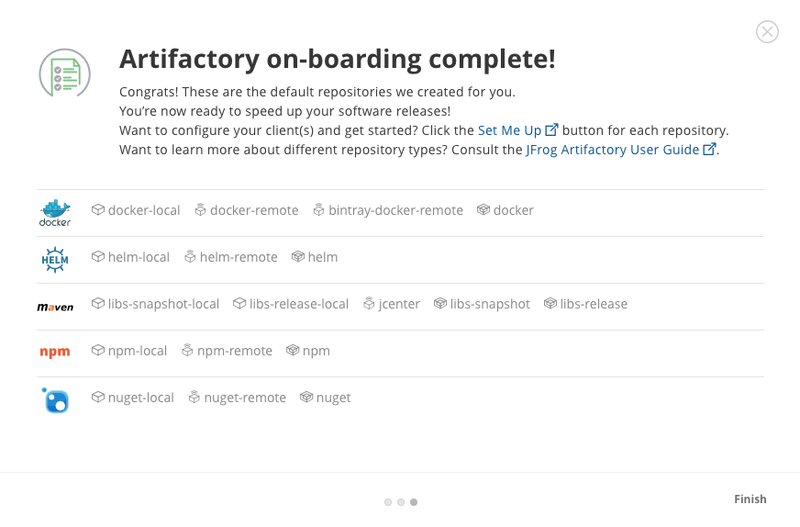 From the Artifactory Home page, click the Docker virtual repository in the Set Me Up panel. 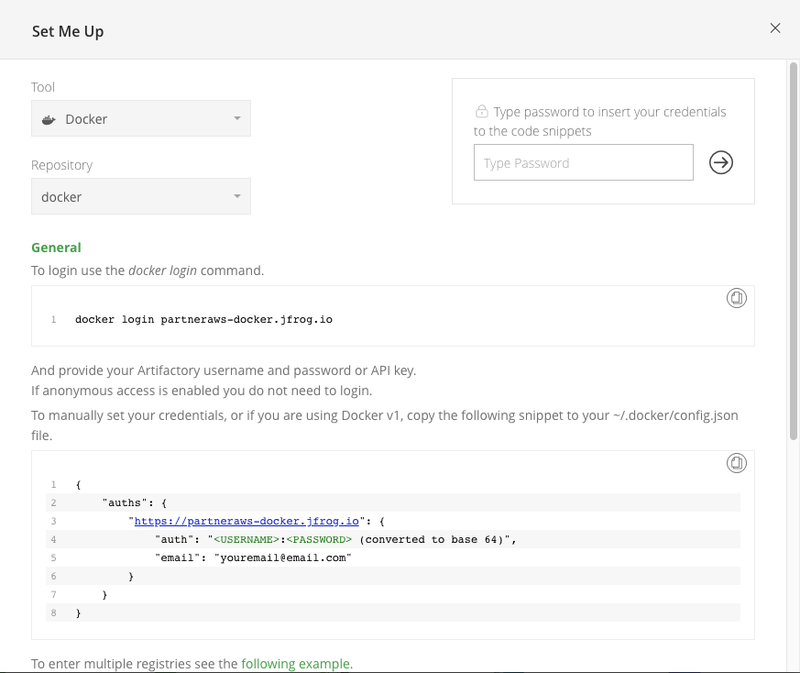 The command to log in to your Docker registry is displayed. Copy the docker login command to log in to the Docker client. Use your Admin username and password, as we have not enabled anonymous access. Proceed to use the Docker client. In the Artifactory Package Viewer search for nginx to view it in Artifactory. Click the image to view the tag details. Provisioning a Kubernetes cluster using EKS is just as easy. 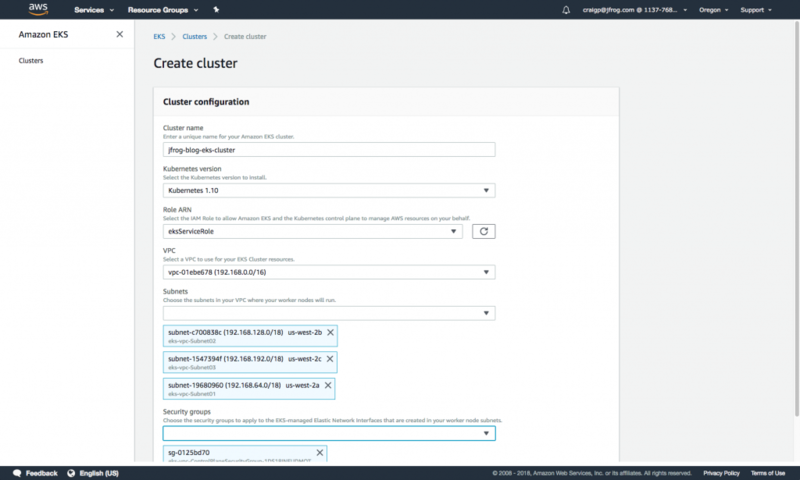 Access the AWS Amazon EKS console and click Create Cluster. The settings in our example are the default settings used for the EKS trials. Your settings may vary. As the cluster is provisioned, the EKS progress is displayed. The endpoint is displayed when the process ends. Configure the worker nodes as described in the AWS EKS documentation. Make sure that kubectl is setup as per the AWS EKS documentation. Verify that the pods are not deployed. Now let’s run a simple nginx deployment on the EKS cluster using the Docker image from Artifactory. Create a Kubernetes secret to authenticate with your private Artifactory hosted Docker registry. Create a simple Kubernetes .yaml file to run two pods of nginx. Referenced from the Kubernetes Deployment Example. Create the deployment using kubectl. Creating a safe and effective way to run cloud-native applications has never been safer or easier than before using Artifactory as your Kubernetes registry for clusters managed by AWS using EKS. 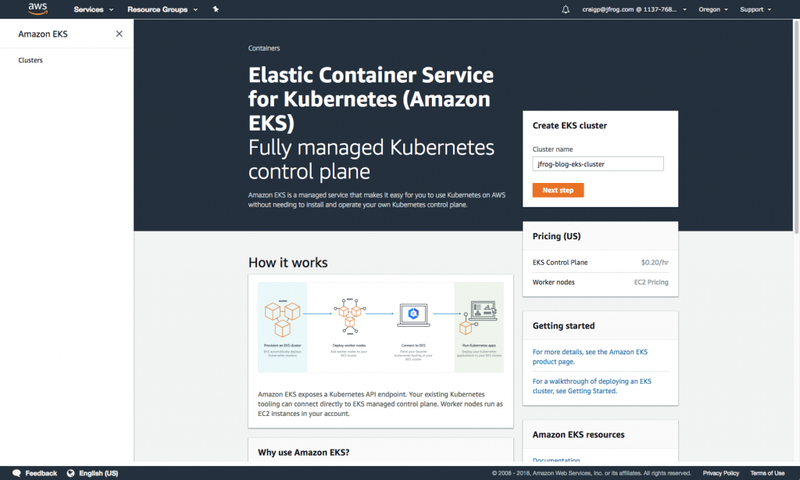 Click to try Amazon Elastic Container Service for Kubernetes (Amazon EKS) and JFrog Artifactory Cloud on AWS Marketplace free trial. We’d appreciate your feedback. Please provide me your feedback at https://www.twitter.com/peterscraig.